Steve Rubel re-mentions blummy on his blog. Thanks a lot! I'd like to take this chance to show you some of the lesser known blummlets (or bookmarklets if you prefer). Take a look at how I have configured my blummy. The favorite of my blummlets (and in this case it deserves to be called like that, as it is an image), is the Alexa blummlet on the bottom. I just have to open blummy on any page on the web and I can instantly see how much traffic it has (well as far as you can count on Alexa on that). When you add the blummlet you might want to resize it to fit yours. So first add it to your blummy, then resize the blummlet by holding shift and drag from within that blummlet. Voilá. Click2Zap by Steve Clay (site is currently down) is something for you if you print web pages a lot. 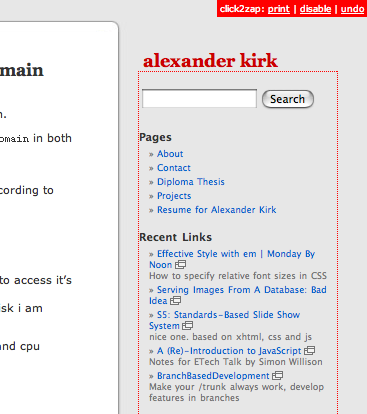 I dislike reading long texts on-screen (waiting for the Sony PRS-500), I print blog texts a lot. Using click2zap you can remove unnecessary text or links from a web page before you print it. 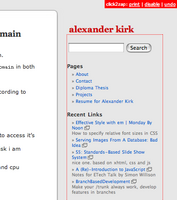 You can click on a paragraph, a red dotted border will appear. You click again, it's deleted. Very neat. 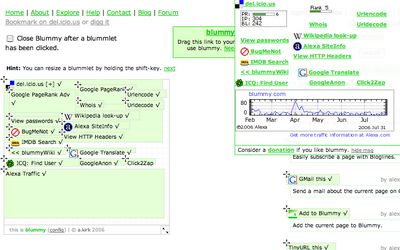 What Google Notebook has added to Firefox, has been possible through Blummy for a long time. Cross-browser. When you surf around you can use the BlummyWiki to store information you find on a page for later use. Or maintain a list of your most often visited pages. Most useful thing about it is that can use the same blummy account on multiple browsers and multiple computers. Andy Roberts already had some ideas what to do with the BlummyWiki. Check it out. Some new features now, mainly fulfilling public requests which I had to admit opened a few annoyances. [Feature] Close Blummy after clicking on a blummlet. 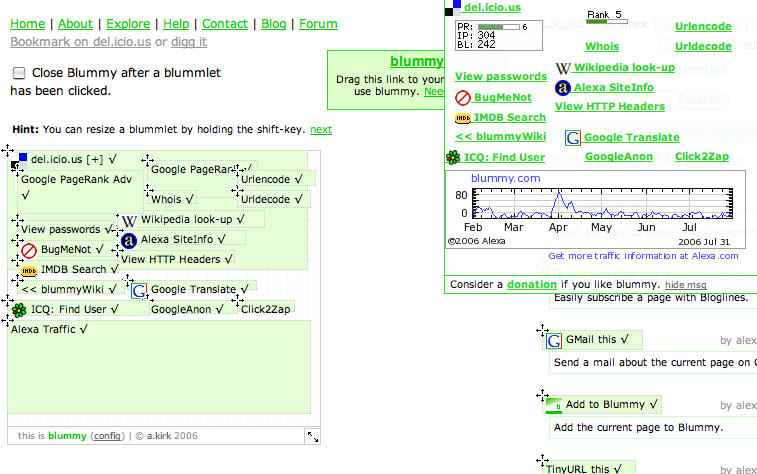 Blummy will disappear after you have clicked a blummlet. This option is under advanced view on the config screen and under Preferences. [Feature] You can now turn off the password request when using blummy. Although most browsers should give you the option to remember the username/password combination, still here and there the query poped up. So now you can make your blummy available to everyone again (so it will omit the query). I also created a small donation page. If you think that blummy is good value, I'd appreciate a small donation. Thanks!